Earlier this week, Paul Davis at American Banker sounded the alarm around the risk of community banks losing the small business segment to national and alternative lenders offering digital products. The article is a critical read for banking leaders. As a company that works with community and regional bank executives on a daily basis and is 100% focused on developing software for them to address this strategic imperative, we want to be clear: it is not too late for community and regional banks to win in this David and Goliath story. 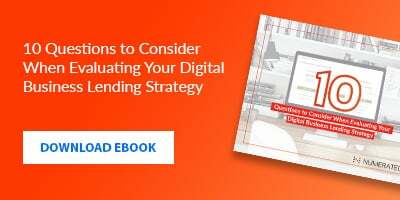 The urgency around digitally serving businesses must be expanded to larger credits of up to $1M in size. A winning strategy does exist for banks looking to out-compete national digital lenders in their markets; it centers on combining the power of real-time lending with these banks' entrenched relationships in the community. If you look at aggregate origination volume, more than 50% of sub-$100K credits are executed by just 5 national financial institutions. All of these financial institutions offer some form of digital lending. Equally, if not more, alarming is that these national financial institutions are moving up-market at a rapid clip to steal market share in larger credits. For example, American Express has grown originations between $100K and $1M approximately 90% in recent years. They're using the same successful strategy that leap-frogged them into the top sub-$100K lender position to do this: combining a convenient digital lending experience with targeted marketing touting speed and convenience. So when community banks and regional banks make the decision to delay or not develop digital lending competencies today, they are not only making a decision to fall behind in or abdicate small credits. They are making an active decision to take on the risk of losing large credits, which has the potential to cripple balance sheets. Despite the headlines and trend lines, it's not time for community and regional banks to succumb to pressure and admit defeat. There are in fact community and regional banks today out-competing national digital lenders in their markets with real-time lending. And we speak with more and more banks every single day that are looking to replicate their strategy. Just look at Eastern Bank, one of our customers here in Massachusetts. Real-time lending is at the center of their business banking strategy. They're not only leveling the digital playing field with real-time lending; they're out-competing the national lenders by unleashing the power of their community relationships around this real-time lending product. Offering businesses the best digital borrowing experience in the world; a personalized customer experience that does the borrower's work for them, achieves Net Promoter Scores of 100, and delivers compelling word-of-mouth referrals. Targeted digital and direct marketing that touts real-time convenience and delivers high campaign ROIs through pre-scoring businesses that are eligible for financing and funneling marketing dollars solely to them. Leveraging banker and branch sales enablement tools to capitalize on the bank's community relationships; tools that, for example, surface ideal business targets (like those paying alternative lenders) and enable anyone at the bank to close a loan in-branch, over-the-phone or in-the-field. Combining relationship banking with a highly compelling real-time borrowing experience has been embraced as the winning strategy for community and regional banks today. It's also the winning strategy for defending against ensuing competition in large business credits, providing runway to develop the core competencies necessary to defend against the national digital lenders moving up-market to large credits. Community and regional banks should not forget that businesses—especially small businesses—want to bank locally. Seacoast Bank in Florida, a well-known leader in digital that we are proud to count as a customer, outlines some of the reasons why: personalized attention, deeper knowledge, fewer fees, incentive to support the local economy, speed of servicing, and more. Community and regional banks should also not forget that businesses that have been lured to national financial institutions can absolutely be won back. Our partner FIS revealed in its 2018 PACE Report that the businesses most likely to switch banks are the ones banking with large financial institutions. At the end of the day, community and regional banks can and are out-competing national digital lenders. We are proud to empower more and more of these banks with a real-time lending and growth platform designed to help them become the #1 business lenders in their markets. Note: We originally developed Numerated's real-time lending and growth platform within and for Eastern Bank to address competition from national digital lenders in business banking. After growing Eastern's loan portfolio 4X and out-competing national banks to become the #1 small business lender in Boston, the technology was spun-out in 2017 as an independent company to empower more banks across the country to do the same.